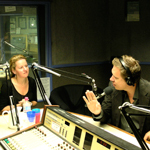 The Plan is a weekly architecture and design talk show on Radio Adelaide 101.5fm and available as podcasts from the show’s website. Discussing all things architecture, environment and affect, The Plan gets a conversation going on integrated design issues and practices in and around Adelaide. Weekly features profile local designers, practices and thinkers from all corners of the built environment. Angelique was one of the founding co-hosts, on air weekly throughout 2010-2011, and continues to contribute from time to time. Projects like this radio show are instances where the rubber hits the road. Hosting a weekly radio show, and designing the program content as a hosting team, is all about thought leadership  promoting a conversation for critical reflection, change and investment in public life- as well as being a lot of fun! Listen to the Podcast: Podcast_Wed 24 Jul 2013 This week we chat live in the studio with Angelique Edmonds. Just returned from a Summer spent in Europe, Angelique fills us in on her journey into the world of social entrepreneurship.